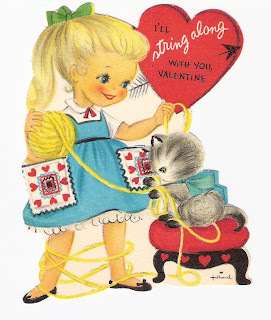 Okay, I'll admit it -- other than vintage children's books, my favorite thing to list is vintage Valentines! I lucked into a big box of them recently (I'll be listing more the next few weeks) and they are fun to look at, read, and learn about. This cute little Hallmark Valentine card is from the 1960's. I love the '60's look of the little girl with her ponytail and retro dress. She is knitting as her kitten "helps." The card reads, "I'll string along with you, Valentine." CUTE!